Comments for german sheperd ears?? As the poster stated, the ears will come up on their own anywhere between 3-9 months old. My white shep had his up at 3 months, but if he was pooped, they drooped. My older gsd-cross did not have his up until about 8 months. After an overly exhuberent play session with a poodle, one ear suffered a laceration, and now it flops. It adds character and gives him a quizzical expression. When he alerts to wildlife (I live in bear/cougar country) both ears go up, then the droopy one immediately flops. I call it the DEW system (Dog Early Warning). BOL (bark out loud) PS...what a cutie! 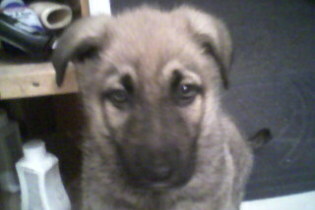 Hi, no, a German Shepherd pup's ears will stand on their own around 4 or 5 months of age. If they haven't at a year old, they probably won't, and the best thing to do is appreciate your dog for his uniqueness. GSD ears are never pinned -- they stand on their own, or sometimes just don't -- but pinning in this breed is not effective and really unpleasant for any dog, even for young pups of breeds where it is done routinely. Don't torment your dog and just enjoy his aesthetic as is!